What causes this common symptom? A sore throat is often one of the first signs of a common cold. It can start with a slight scratchy feeling and within a day you can be struggling to eat or even speak. So what causes this nasty symptom, and what can you do about it? 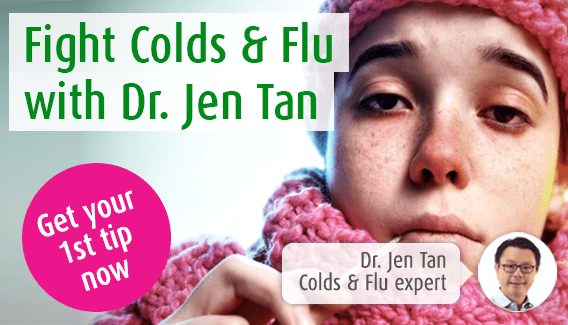 Dr. Jen Tan explores on this page. One of the worst symptoms of a cold can be a sore throat. It can make swallowing, eating and even talking painful. Since it’s often one of the first symptoms, it can be a good warning sign. At first you’ll probably feel a slight scratchy or tickly feeling at the back of the throat, but this can later develop into a throbbing ache. What causes a sore throat with the cold? A sore throat is mostly caused by the inflammation of the tissues in the throat. Inflammation occurs as a reaction to a viral or bacterial infection in order to attract the attention of your immune cells. Bacteria and viruses also don’t like heat, so inflammation can help to burn them out. The lymph nodes in your throat, often referred to simply as glands, also play a key role in immune defence. They help to filter fluids, trapping pathogens and destroying them using white blood cells called lymphocytes. This extra activity in the glands in your neck can exacerbate inflammation in the throat, and as your glands swell this can put pressure around the throat. In some cases a sore throat can be caused by dryness, which tends to occur if you are breathing through your mouth more as a result of a blocked nose. You may find that your sore throat develops into a cough in the later stages of your cold due to this dryness and irritation. The most common home remedy for sore throats is probably honey and lemon. This hot, soothing drink is packed full of natural antibacterials and antivirals, meaning it can help the healing process. Honey is also really soothing and leaves a protective layer in your throat to ease irritation and prevent dryness. Gargling salt water is also thought to be beneficial. Salt water is really cleansing so this is a great way to help cleanse the throat of bacteria and viruses. Click here for more tips on easing a sore throat naturally. To treat your overall symptoms and help your immune system fight off the underlying infection, we recommend Echinaforce tincture or tablets. To ease your sore throat specifically, we recommend the Echinaforce Throat Spray, made from fresh Echinacea and Sage. Sage has a long history of medicinal use and is particularly useful for sore throats. The remedy is really cooling and soothing, which is perfect for tackling your sore throat on the go. You can also try our Echinacea Lozenges which contain fresh Echinacea as well as soothing honey and cooling menthol. What conventional medicines can I use? Remedies such as throat sprays and lozenges are widely available in supermarkets, pharmacies and health stores so these should be easy to find. Some of these throat sprays act as mild local anaesthetics, helping to numb the throat. These can be highly effective when your throat is really sore, but bear in mind that these can often not be used for more than a couple of days in a row. Always check the patient leaflet for directions. You can also take painkillers to help reduce the pain, but remember that other cold remedies like decongestants can contain paracetamol too, so make sure you don’t take too much at once!